Contract Approval is one of the most important setups. It determines who will the approver of the contract and upon successful approval only a contract become Active and entitled to offer service to customer. Prior to R12 contract approval is determined through a profile option 'OKC: Contract Approver'. But in R12 the standard contract approval workflow integrated with Approval Management Engine (AME) to control and run the approval process. Key attributes are integrated in AME for Service Contracts. Below list provides bunch of service contract seeded attributes available in AME. If required you can create your own attributes as well. To get better idea on AME please refer to Oracle Approvals Management Implementation Guide. Define AME condition based on the attributes. Define action type for the actions. Define action in AME by defining AME approval groups containing approvers as member. Define rule considering conditions and actions. Accessing Approval Management Engine is based on roles assigned to user. Follow the below post to understand how to access Approval Management Engine. Navigate to Approval Management Business Analyst responsibility. Goto Approval Process Setup region and search for 'Service Contracts Internal Approval'. Click on any link below Attribute / Conditions / Action Types / Approver Groups or Rules to directly go that page. Search for 'Service Contracts Internal Approval' transaction type in Approval Process Setup region. Select Condition type Ordinary or Exception. Select a contract attribute based on which you want to decide approval. In this case I used operating_unit to set contract approval. Select operator from LOV of expression section. Enter the desired value and click on apply. Search for 'Service Contracts Internal Approval' transaction type in Approval Process Setup region. If you are already under the transaction type then just go to Action Types tab or Click on Action Types link. Search and choose 'approval-group chain of authority'. You can choose any other action type based on the requirement or create your own. Click Continue and Finish. The action type will now show in the page. Search for 'Service Contracts Internal Approval' transaction type in Approval Process Setup region. If you are already under the transaction type then just go to Approval Groups tab or Click on Approval Groups link. Click on Create button to create new approver groups. Enter Name and description of the new approver groups. First Responder Wins :The first-responder-wins regime assigns group-or-chain-member order number one to all members. In this case, only the one responder must approve; all other members' responses are recorded but ignored. Order Number : The order number regime sets each member's group-or-chain-member order number to the member's member order number. All group members must approve. Serial : The serial regime assigns group-or-chain-member order numbers in ascending order of the member order numbers. All group members must approve. Enter Usage Type Static / Dynamic. If chosen dynamic then you must enter a sql statement to pull the values dynamically and validate. 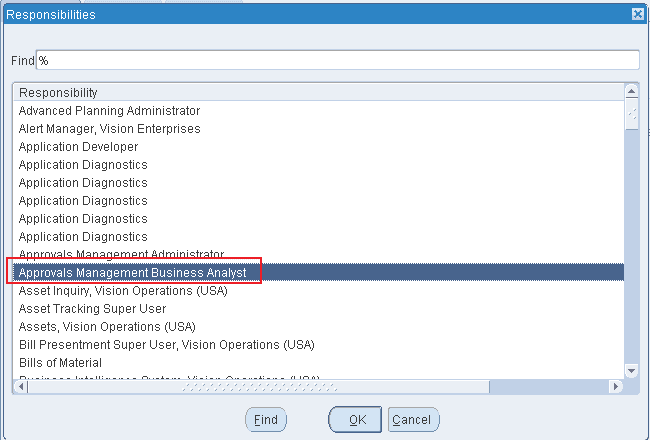 FND Users : It pulls out the user define in Oracle Applications to access applications. Nested Group : This is used when you have a group having multiple sub groups. 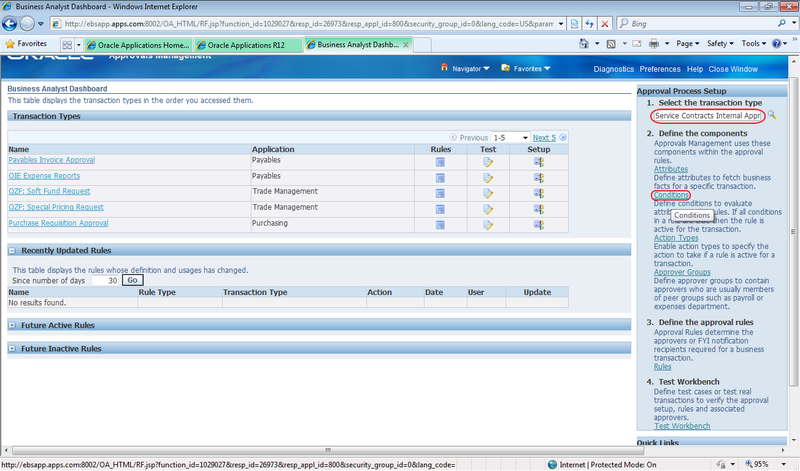 HR People : It pulls all the employees defined in Oracle Applications from HRMS module. Click on search icon next to Approver and find respective group member and select it. Search for 'Service Contracts Internal Approval' transaction type in Approval Process Setup region. If you are already under the transaction type then just go to Rules tab or Click on Rules link. Click on Create button, it will open the create new rule page. List Creation : List-creation rules generate chains of authority. They use action types that ascend an organizational hierarchy to generate one or more chains of authority. A required attribute typically identifies the first approver in each chain, and the specific action Rules determines how many approvers are in each chain. List Creation Exception : List-creation exceptions also generate chains of authority. The difference between a list-creation rule and a list-creation exception is that an exception suppresses selected list-creation rules. List Modification : List Modification rules used to modify the default chain of authority generated by all applicable list-creation and exception rules. A list-modification rule can have (but need not have) ordinary conditions. However, it must have exactly one list-modification condition. Sometimes you want to make exceptions regarding the approval authority granted to specific approvers, rather than the approval authority required for specific kinds of transactions. To do this, you need a list-modification rule. Substitution : To delegate one approvers authority to another user we user Substitution. Pre List Approver Group : If you want to have one or more groups of specialists approve a transaction before or after the chain of authority does. In such cases, you need a pre- or post-list approval-group rule. Select Start Date and End Date for the rules effectivity. Click next to go to next stage. Click on Add Condition and choose the available conditions that we defined earlier. Click on Add Action and choose action from Action LOV. Click next to review the rule. Finish to complete the rule setup. Search for 'Service Contracts Internal Approval' transaction type in Approval Process Setup region. If you are already under the transaction type then just go to Test Workbench tab or Click on Test Workbench link. Enter the desired value in the attributes, since I defined contract approval for operating unit I will provide the operating unit detail. You can save it for later testing by clicking on Save for Later button or click on Run Test Case to execute the test. Next page will show the results. Here you will notice that it shows the approval rule that we defined and its pulling the details if the group member to whom approval will go. To more details you can click on the View Approval Process Stage. This is really helpful to understand complex rules.